"You shouldn't be fiddling around with any kind electronic gadget in your car while driving," said Minnesota state Rep. Frank Hornstein, who helped write his state's no-texting-while-driving law. "I would guess that the states wouldn't intend to be sending a mixed message, but it sounds like it could be a mixed message," said Judie Stone, president of the Washington-based Advocates for Highway and Auto Safety. Drivers should "check our Web site before leaving. If you're at your office, before you leave and there's an issue on the roadway, it might alter your travel plans home," said Randy Ort, spokesman for the Arkansas Highway and Transportation Department. While Washington state lets motorists tweet about traffic conditions, in most states the flow of information is one-way - from state officials to drivers. Some states, such as New York and Indiana, send lots of up-to-the-minute information. Others just tweet intermittently, or reserve Twitter for emergencies. Mississippi, for example, intends to use its service during hurricane evacuations. 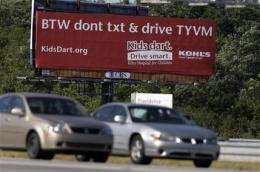 "We don't want people reading their tweets while they're driving," said Sally Ridenour, spokeswoman for the Oregon Department of Transportation. Others want to know why traffic isn't moving. "wsdot any idea what's going on westbound on 520? it's worse than rush hour..," a user posted. Within a few minutes, officials responded: "Yes! There is a disabled vehicle just east of Lk Wash Blvd blocking right lane." "If you're sitting there and trying to update the world on the congestion you're in, you could be part of a collision," said Fairley Mahlum, spokeswoman for the AAA Foundation for Traffic Safety. "Did it really matter that you needed to tell everyone and their brother what the situation is? It's just not really not worth it." Missouri state Sen. Ryan McKenna, who sponsored the law in that state banning texting by drivers 21 and under, said he supports Missouri's Twitter page and doubts police will bust young drivers just for reading tweets. McKenna said his chief concern is drivers typing messages, not those glancing briefly at an incoming tweet. "You've got to have a little leeway with every law," McKenna said. "I've driven 72 mph in a 70 mph speed limit. People are going to look down real quick" at their phones. I can drive and do stuff 100% as safe as just driving. And Im SICK of being quoted stats that say otherwise. I just remember what the IMPORTANT task is 100% of the time. All drivers are not 100% the same. INSTEAD OF BANNING IT, TEACH DUMB DRIVERS HOW TO DO IT SAFELY. Which includes NOT typing at all during many, BUT NOT ALL, driving situations. In any case, CALLING IS WAY SAFER, and thats already, stupidly, banned in many areas. Of course, upgrading the drivers licence programs to develop safety for calling and texting, and testing all drivers on it at renewal, would be very costly compared to banning it. Maybe that option is what should be voted on instead of no option. Stop assigning cause to distractions in accidents. Its the driver that allows himself to be distracted (not the distraction) that is the cause. Ya know how truck drivers have to get special licence? Well we could do that too for 'gadget' use. So if you wanted to use your cell phone legally while driving, you would have to get a special qualification added to your license.